Maruti Suzuki launched new Maruti Alto 800 in 16th October 2012, Maruti Alto 800 new model hosted a new engine block and this will have both fuel efficiency and the power factor to impress. The 2012 Alto 800 has gained sufficient height and width to match current demands. The front end has some design borrowed from the existing Maruti A-Star, there is a notable presence of wind cutter on the front bumpers. The overhauled Maruti Alto will come with an all new front fascia that features small grille and laid back headlamps. The lower grille has adopted a hexagonal shape. New Maruti Alto 800 seems like a fresh breath of air and represents Maruti India’s new design philosophy. The new Alto 800 has also gone taller and offers more headroom space. Maruti Suzuki Alto 800 would have more to offer from cabin space to good ergonomics. 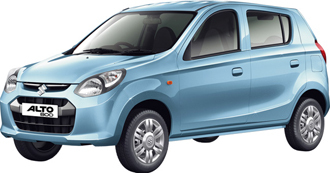 Since the introduction of the Maruti Suzuki Alto in the year 2000, it has not received any upgrades.